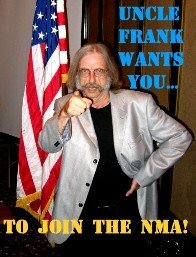 Now begins NMA LiveBlog2013, your source of news, views and sea stories from The Navy Musicians Association reunion in Virginia Beach. The reunion starts Wednesday, but the activity will begin today. The Commodore of Navy Lyres at the Command Center. It's still quiet about the decks, as the equipment bearers have not yet arrived bearing equipment, so it's still quiet about the decks of the Holiday Inn. But the news stream is flowing. I just heard from NMA member Mike Vax a veteran two prominent bands, U.S. Navy Show Band and the Stan Kenton band. He's arriving late tomorrow night and hoping a jam session will be in progress. You never know; the reunion doesn't start officially until Wednesday morning, but members who arrive a day ahead of time generally have a hard to keeping their horns in the cases. Speaking of the Show Band--and there's been a lot of that going on recently-- another UNITAS vet, Mike Beegle will soon get important advisory word from his doctor. Mike had a medical scare a few days ago and is weighing the prospect of fun with his shipmates against the reality of maintaining his health. Did we sound this good? Hoist the anchor, ahead all engines.